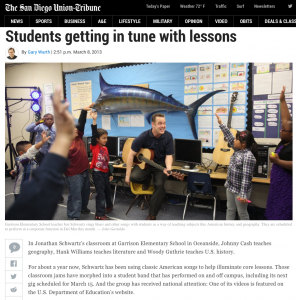 In Jonathan Schwartz’s classroom at Garrison Elementary School in Oceanside, Johnny Cash teaches geography, Hank Williams teaches literature and Woody Guthrie teaches U.S. history. For about a year now, Schwartz has been using classic American songs to help illuminate core lessons. Those classroom jams have morphed into a student band that has performed on and off campus, including its next gig scheduled for March 15. And the group has received national attention: One of its videos is featured on the U.S. Department of Education’s website. Full article at San Diego Union Tribune.